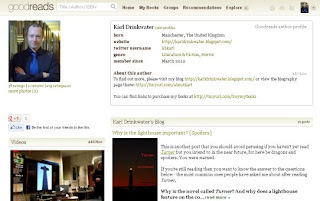 I've now joined another social networking site, an important one for bringing readers and writers together, or readers and new books - Goodreads. It is very clever. You can rate or review books you have read, and based on what you liked and didn't like it will make recommendations of other books you might like to try. It has already brought many titles to my attention that I can't wait to read. You can also see what friends are reading and get in touch with like-minded people. My profile is here: please befriend me if you have a Goodreads account! As a writer it is also important to have details of your work on Goodreads so that people can find and discuss it. I added Turner here. There are various ways you can promote your books e.g. I took part in a giveaway competition and sent print copies of Turner to the Goodreads winners - which gains exposure for your book, and may lead to reviews and ratings, eventually (hopefully!) feeding back into sales. If you rate enough books you have the opportunity to make an application to become a librarian. This lets you add and edit bibliographic details for books. As part of the process you have to include a summary of why Goodreads staff should approve your application. This was easy for me - I pointed out that I am a real-life librarian! Since becoming a Goodreads librarian I have already created book records, merged and updated data, and so on.